FORT WORTH, Texas — The sold-out crowd on Monday, Feb. 15, at The Fort Worth Club was treated to a special evening with special people at the 39th annual Davey O’Brien Awards Dinner. 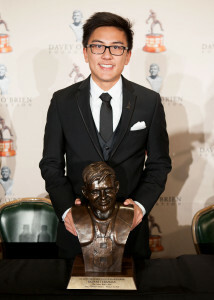 Winners of all four of the Foundation’s awards—the Davey O’Brien National Quarterback Award (Deshaun Watson), Davey O’Brien Legends Award presented by Low T Center (Craig Morton), Charles Ringler Founder’s Award (Verne Lundquist) and Davey O’Brien High School Scholarship (Raymar Turangan)—each spoke to the crowd upon receiving their awards. 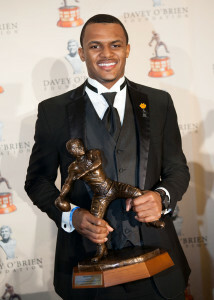 In 2015, Watson became the first player in NCAA FBS history to record more than 4,000 passing and 1,000 rushing yards in a season. He led Clemson to the national title game, where he set an all-time championship game record with 478 total yards in the contest. Morton was the first quarterback in NFL history to lead two different teams (Dallas Cowboys and Denver Broncos) to the Super Bowl. The College Football Hall of Famer remains one of just three ever to accomplish the feat, alongside Peyton Manning and Kurt Warner. 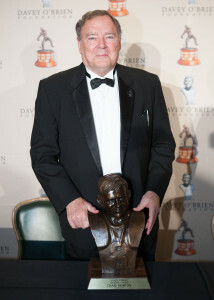 Lundquist is the current chair of the Davey O’Brien Award’s National Selection Committee. 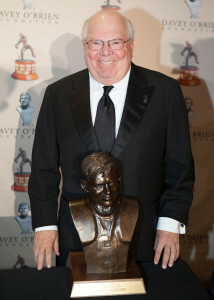 The lead play-by-play announcer for CBS Sports’ coverage of college football, he was inducted into the National Sportscasters and Sportswriters Association Hall of Fame in 2007. Turangan is the 30th winner of the Davey O’Brien High School Scholarship issued to an outstanding high school senior student-athlete in North Texas on the basis of character, community service, leadership, scholarship and varsity sports participation. Turangan is a swimmer at The Colony High School. Five former Davey O’Brien Award winners—Jim McMahon (1981), Don McPherson (1987), Eric Crouch (2001), Brad Banks (2002), Colt McCoy (2009)—were on hand to welcome Watson to the exclusive fraternity. A number of other VIPs were also in attendance, including NFL Hall of Fame quarterback Roger Staubach, current Dallas Cowboys head coach Jason Garrett, Cowboys broadcaster Brad Sham and Heisman Trophy winner Tim Brown. Brown and O’Brien each attended Woodrow Wilson High School in Dallas, making it the lone public high school in the country with a pair of Heisman Trophy winners. Also as part of the festivities, the participants took part in a press conference Monday afternoon and were treated to a welcome dinner at Joe T. Garcia’s on Sunday night. In addition, Watson spoke to students at J. Martin Jacquet Middle School Monday morning.